The Wrong Kind of Muslim: An Untold Story of Persecution and Perseverance is one of my favorite books of all time. Its author, Qasim Rashid, a friend and brother of mine, journeys into the heart of terrorism to unearth the untold story of those silence by Islamic militants. Rashid uncovers the inspiring untold story of millions of people fighting back for the sake of unity of all faiths and no faiths. That title – “The Wrong Kind of Muslim” – rushed through my mind while I was reading a few horrifying stories of “The Wrong Kind of Christians” in America. A large roundup of Iraqi Chaldean Christians by Immigration and Customs Enforcement (I.C.E. ), as Newsweek notes, has been met with widespread criticism toward President Donald Trump, who previously pledged to protect such communities from persecution in the Middle East. Vox notes that Chaldeans are Catholics from Iraq who speak Aramaic, an ancient Semitic language once widely spoken in the Middle East. The Chaldean Community Foundation estimates some 121,000 Chaldeans live in the Detroit area, the largest concentration of Chaldeans outside the Middle East. Some 200,000 more live in others parts of the U.S. Approximately 1,400 Iraqis – more than 300 of whom are Chaldean Christians – face the prospect of deportation. 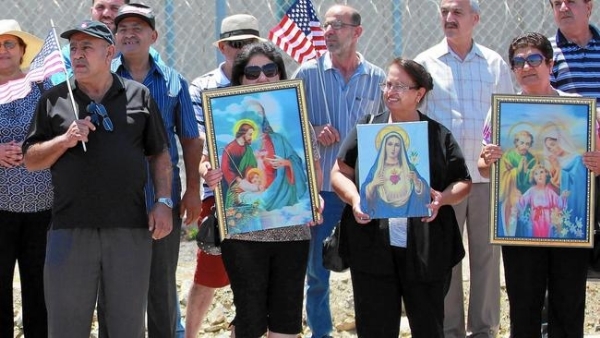 Dozens of Iraqi Christians have been rounded up in Michigan just this past weekend alone. According to Martin Manna, an American-Iraqi Christian advocate and president of the Chaldean Community Foundation, there have been roughly 40 arrests to date. The situation remains dire. It is no secret that Iraq is a country in chaos. Iraq ranks #7 on Open Door’s World Watch List, which calculates the 50 countries where it is hardest to be a Christian. In 2003, there were approximately 1.4 million Christians in Iraq, but today there are fewer than 175,000. Mike Arabo, president of the Minority Humanitarian Foundation, which aids victims of ISIS told CNN, “There are Christians that will be slaughtered as they arrive in Iraq. It’s inhuman, it’s unfathomable.” Arabo added that the Minority Humanitarian Foundation will file a federal lawsuit demanding that the Chaldean Christians remain in America. Activists such as Steve Oshana, an Assyrian-Christian who is executive director of A Demand for Action, a non-profit that assists at-risk religious and ethnic communities in the Middle East, have attacked Trump for allowing authorities to send Christians back to places like Iraq, where previous administrations have said a “genocide” against Christians was occurring. The Christians that face depotation will be targeted in Iraq for their Christian faith, but also their Chaldean ethnicity. ISIS’s reign of terror on Christians is well-documented. ISIS has its origins in Iraq’s Sunni militant movement. In 2014, it took control of up to 45% of Iraq, subjecting Shiites, Christians and ethnic minorities to mass torture, enslavement and executions.